Google webmaster tools are very beneficial tools provided by Google for webmasters and bloggers. Using Google webmaster tools is the first and the most important step to be a successful blogger. It helps you to generate "organic traffic" for your blog. Organic traffic means the traffic which you get from search engines. With Google webmaster tools you can control your search engine results in other words Google webmaster tools allow you to make your blog Seo friendly. Google webmaster tools are easy to use and works fast, but as a beginner its not easy for anyone to use these tools. So today in this post I will show you how to start using Google webmaster tools. It is your first class to start using Google webmaster tools and my first post about using Google webmaster tools for blogger, so if you have any question don't hesitate to ask me in comments or by Contacting me.To start using Google Webmaster Tools first you have to submit your blog to Google webmaster tools, so follow below steps to add your site to Google webmaster tools. 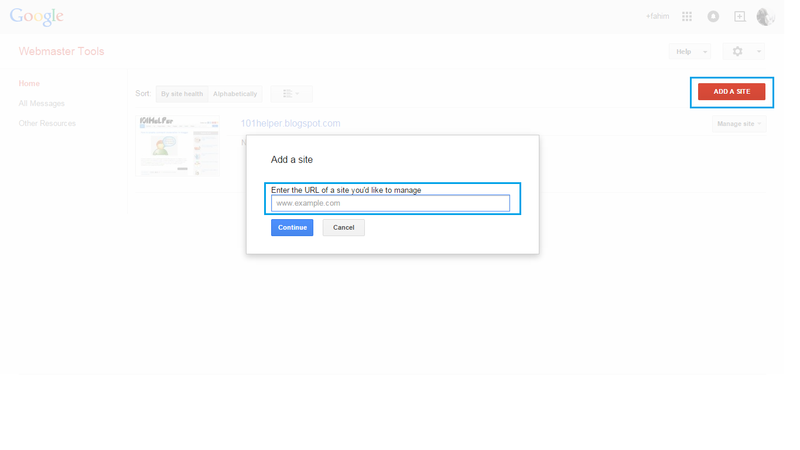 Step 1: Go to https://www.google.com/webmasters/tools and log-in to your blogger account. Step 3: Click on continue and you are done. Step 2: Edit Html and search for <head>. Step 4: Now go to Google webmaster tools and click on verify. That's it you are now a verified owner of your blog at Google webmaster tools. Once you have verified your blog the next step is to submit your blog's Xml sitemap. Read this post to learn how to submit blogger sitemap to Google webmaster tools. After submitting Sitemap to Google webmaster tools, it may take a while for Google to show your blog's data. I hope that you like this post and you found it helpful. If you have any question or suggestion feel free to ask me by leaving a comment below. For more blogging tutorials subscribe to 101Helper's news letter below. Share this post with others and help 101Helper grow. Search tags: How to add your blog to Google webmaster tools, Google webmaster tools tutorials for blogger, how to submit a blog in google webmaster tools, Google webmaster tools step by step tutorials for blogger, 101Helper blogging tutoials.